Janice Newlin is an adjunct instructor who teaches Educational Technology courses for two universities, Athens State University in Athens, Alabama and Auburn University Montgomery in Montgomery, Alabama, USA. 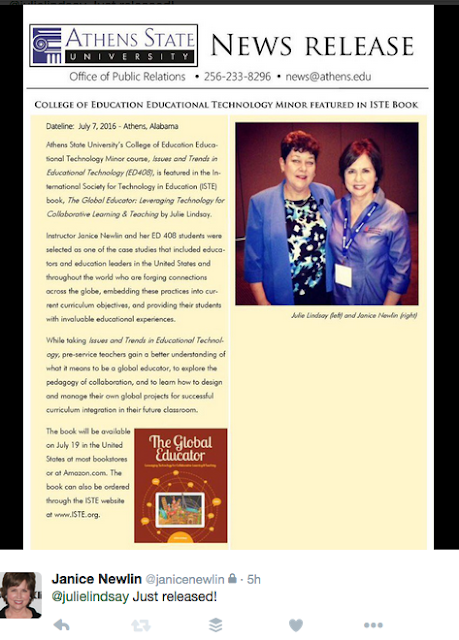 She is one of the teacher educators featured in The Global Educator and has been actively involved with Flat Connections global projects for many years. In the case study Janice shares her ideas for redesigning teacher eduation in order to prepare students to promote global understanding in their future classrooms, be fluent with technology tools to support collaborative learning, and understand global project design through hands on assignments and activities. Janice shares some of her Athens State University student work here, and you are invited to read more on the Flat Connections blog. This is the fourth post in what will be a 36-week series featuring the 36 case studies from my book, 'The Global Educator: Leveraging Technology for Collaborative Learning and Teaching'. This book was published by the International Society for technology in Education in July 2016. It contains contributions from over 100 educators and case studies featuring over 50 educators. Follow this blog series via category 'theglobaleducator', and subscribe to the podcasts via PodBean.